Design Principles are high level guidelines or techniques to design better software programs. These are a set of rules, if applied in your program, can make your life a lot easier when there’s any enhancement or requirement change comes. In normal language these principles are nothing but a way to design good software programs, which fixes a lot of design/architectural issues. There are 5 Design principles we normally heard and use in our day today codding life and are called as the SOLID Principles. This principle says that a class must be responsible to do only one/single work, not more than that. So, the class must have only one reason for change. Let’s say you have a class for Invoicing where you do all works related to invoicing like, calculating amount, taxes, shipping charges and all. Along with that you must do some other things as well like sending emails to customers and updating the Database. So here the Single Responsibility Principle says that your invoicing class must not do anything apart from Invoicing like sending emails and updating Database. Hence keep those in separate classes and leave the Invoice class to focus only on Invoice part rather than focusing on multiple things. This principle says that entities like classes/methods/modules should be open for extension not modification. In simple words it states that once you developed and tested a method/class/module, you should only change it to fix bugs, but not to add new functionalities, rather you should have that scope for that classes/methods/modules to extend or adapt to have new functionalities. Let’s say there is a class that is intended to do those invoicing works, which contains a lot of methods and properties to calculate and process invoice. We are done with the development and done with the unit testing and deployed it to production. Now some requirement changes happen where we have to introduce another type of invoice called recurring invoice. Here our class should not be modified according to Open Closed Principle to add those functionalities because if we do that, all the testing we did will go in vain and we need to test it again. So here we should design the class in such a way that for any future requirements we should not change the class but extend it through interfaces or inheritance to adapt the requirement changes. This principle says that the new derived classes should be perfectly substitutable for their bas classes. If class B is derived from class A then B should be replaceable with A. Consider you have a class Fruit which has a derived class Apple, so wherever you use Fruit, there you should be able to use Apple as a substitutable. This principle states that clients should not be forced to implement those methods of an interface they do not want or use. So instead of having a single Interface break it down to multiple interfaces so that clients can only use those what they want to implement. Consider a situation where we have a situation to design a solution for a Programmer, Lead and Manager. Where Programmer only do programming, Lead can program and manage and Manager can only manage. So, in that case we should have two interfaces one for Programmer and one for Lead, so that the Programmer can implement only programmer class and Lead can implement both Lead class and programmer whereas Manager can implement only lead class. High level modules should not depend on low level modules, both should depend on abstraction. Abstraction should not depend on details but details should depend on abstraction. When a class depends on another class, there is high chances that if we make some changes to one the other will be affected for sure. So, in this case we must keep the high level and low level logics loosely coupled as much as we can, for this we need to make both the classes dependent on abstraction instead knowing each other. Example: Dependency injection is an example of this principle. Hi guys, have you ever done a boring job like validating the hyperlinks and source tags of an HTML document if those are working or not ? I guess some of us might have done this before and did not bother about it. But what about if you were asked to validate those hrefs and src tags of some thousands of HTML files? Would you love it? I am sure the answer is no. Who's gonna love this kind boring work and doing it over and over again? Yeah, you are think it it right. I came across this situation before some days where I have to validate around 1,500 HTML files. I hate this job but what to do? I have to anyhow do it, because I am responsible for it. I started doing it manually for 4-5 files and then got bored and really frustrated. Then thought of some kind of automation. and did it in ASP.NET, C# which helped me do my job of verifying 1,500 HTML files in just 1 single day. So, here in this article I will show you how to do it along with I will provide the tool to download for direct use. 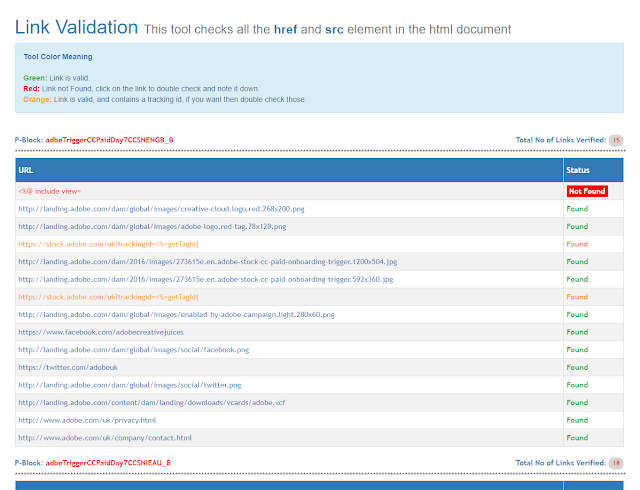 Why do you need a Link Validation Tool? Its very often if you are working on any kind of campaign tool like Adobe Campaign, Fidelity, IBM Campaign or any other campaign tool where you expect a lot of creatives(HTML files). Here is becomes very important you validate each and every link of those HTMLs otherwise when emails will out those wrong and not working emails will take your target users into nowhere hence impacting your revenue. 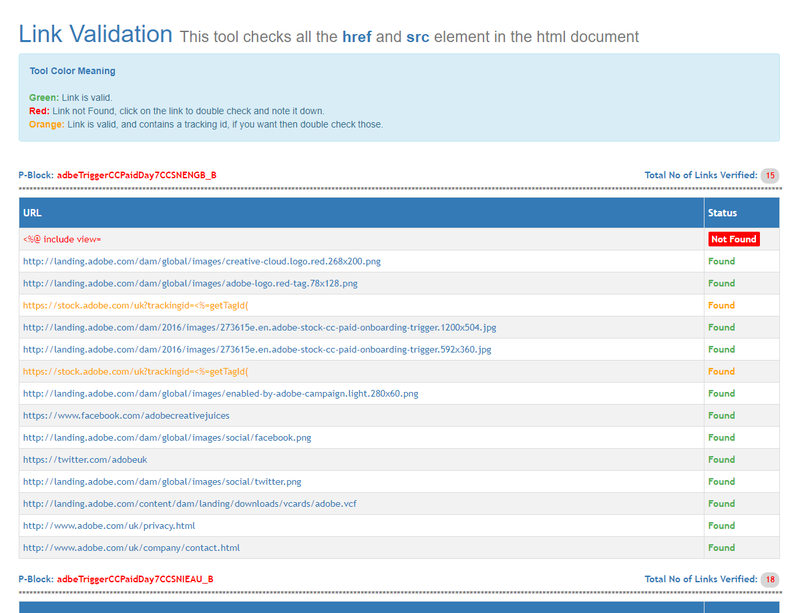 This Link validation tool crawls around 80+ HTML files at once and extracts all the links including href and src tags as well and gives you a well defined report with individual status of each link. So that you can be aware of what link is working and what not. I made this one in ASP.NET, so no doubt its a web application. To run this you can host it in your local IIS or just run it in Visual Studio if you have. If you do not have Visual studio then Download Microsoft WebMatrix, which a free IDE provided by Microsoft. I made this in WebMatrix. As I made this tool in WebMatrix this article will be explaining you how to do it webmatrix, but if you are a .NET guy then you can easily replicate it in Visual Studio. First download Web Matrix from here, I have uploaded it into my Google drive so you need not to search for it in Google. Just get it if you do not have a visual studio. Open WebMatrix and create a new site. Add an aspx page there. As in WebMatrix we do not have aspx.cs file to write the C# code we have to write the code inside a script with runat = server tag. Name the page as index.aspx or whatever you want to call it. Now import the below namespaces to the page, those will be used during creating the tool. In order to make the webpage look better I am using Bootstrap. And putted all the styles in an external css file. Here is the link to bootstrap CDN and the linkvalidation.css file. I will simplify the concept here what I am going to do now. Alright, I will put maximum of 80 HTML files into a particular location and the tool will parse those files and find out all links and try to render those, if finds the response as 200 it will display Found else Not Found. Not Found can be because of multiple responses. I may be 404: Not Found, 500:Bad Request etc. So my Page load event looks something like this. Here I am getting the folder location form the web config file where all my HTML files are being stored. And yes I am getting only the files ending with an extension .html or .htm. So if you have any other .txt or image or any other things at that location it will not parse those files. Take a string builder globally to hold the table we will create during parsing and then will write the response to the HTML body. So I am parsing each and every HTML files in a for loop and getting the entire content of the parsing html file. WebClient will download all the content of the current HTML file and hold it in a byte variable. Now we need to parse those html content to find out all the links it has. The Extract method is having a regular expression that will filter out all the links be it a href or src tag and put hose into a list. Now we need to create the table which will list the links. Here I am creating tabular structure and holding those html into the string builder we have taken globally. So in course of table creation we need to check the status of each link if those are valid or not. I am checking for valid URLs, sometimes in your page you will have some relative paths like "images/test.png", which is not a valid url so while parsing it it might lead to some exceptions. And also sometimes you must have some email address in your page so to exclude those as they are not some valid urls. The use of Parallel is for multi threading, this will make the program faster by validating maximum of 10 links at once as I set the MaxDegreeOfParallelism to 10. GetStatusCode is the method which will take the url and parse it exactly we did in Page Load to read the content of the HTML file. // always compress, if you get back a 404 from a HEAD it can be quite big. Here you might run into a situation where you will be parsing a secure web url there it wont work sometimes so to solve this issue I am defining the security protocol type as SSL3 or TLS12 or TLS 11 or TLS. Which will parse a web url which blocks web crawlers. For this I have mentioned the below line. I specified some properties of the HttpWebRequest variable like AutomaticCompression, its because when this will find a 404 error, it will take a long time download the content as it keeps on trying for several time to download the content. So compressing the request will save a lot of time. Except that I guess everything is self explanatory, how I am filtering the requests as per their HttpStatusCode. Now the coding part is done and we need to set some configurations for the program, like where it will find the HTML files and what to do after parsing. So, to set those settings I have used the AppSetting section of Web.Config. Below is the App Setting section of my program. I made this to work for a certain purpose, so the code might not be fully usable for you, but I am sure you can find it very helpful with a little modification. The FolderLocation key is having the value of the folder where the program will file all the HTML files. And the DeleteFilesAfterParsing key holds the value if you want all the files to get deleted automatically after parsing or not. That's it, we have made a Link Validation tool which will solve a lot of problems if you run into such situation and help you save a lot of time by automating the manual efforts, you were supposed to put. Below is the entire source code for this tool. Check it out. <strong class="c-green">Green: </strong> Link is valid. <br><strong class="c-red">Red: </strong> Link not Found, click on the link to double check and note it down. <br><strong class="c-orange">Orange: </strong> Link is valid, and contains a tracking id, if you want then double check those.